Michael is a brave and courageous 11 year old boy who is so determined to study that he has crafted himself a job as a shoe shiner, in a town of extreme poverty where chances to earn money are few and far between. Michael became an orphan when he lost his father this year, his mother died when he was just four years old. He was taken in by his neighbours but they live with very little themselves. Despite these challenges, Michael has shown amazing strength, striving hard to be self-sufficient so that he can continue his education. He was so determined to go to school, he began shining shoes in the hope that he could afford his school fees, school uniforms, text books and other resources. 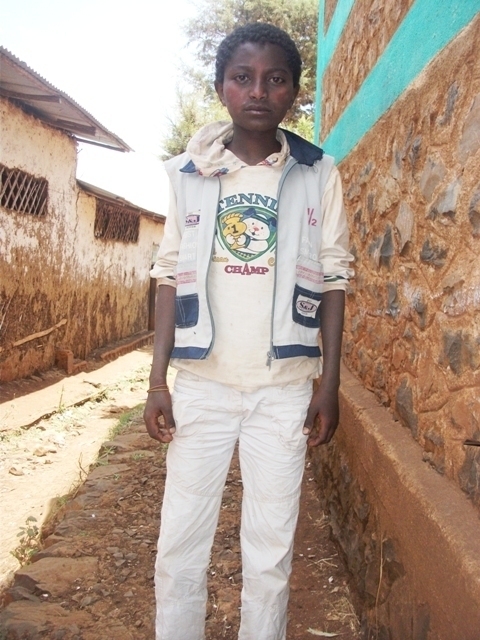 Michael is one of 50 children now attending our new day care centre in Dembi Dollo, Ethiopia. He no longer has to shine shoes to afford the luxury of going to school, and he is guaranteed a regular meal each day, love and support, thanks to Stand by Me supporters and their generosity. We are covering the school fees and resources that Michael needs, so that he can attend the nearby school without worry, and begin to build himself a future. Each child at our day care centre in Dembi Dollo has been given the chance to go to school and the parents and families in the community are very supportive. They have time and enthusiasm to give, but no means of providing financially for their children. Now the children come home from school and attend the day care centre in the afternoons, where they are offered extra educational support from the teachers we employ in the subjects of Amharic, Oromo, English and Maths. The mothers and carers are encouraged to take part in counselling and training in the practice of good care. To fully meet the children’s needs they are also given regular health checks and medication, those with HIV are provided with an enhanced food programme, and all of the children are given a hot, nutritious meal. The kids enjoy playing together, exercising and very occasionally, a little treat. Life has changed for the children of Dembi Dollo, thanks to our child sponsors. You can find out more information about sponsoring a child in Dembi Dollo here. There are many more children in Dembi Dollo who need our help.